One of my favorite things about summer is the abundance of fresh organic tomatos, basil, and oregano that I'm able to grow. Last year's harvest was OK, not impressive. Part of the problem was that it took me a while to realize that I was sharing my harvest with the squirrels and birds who inhabit the woods behind my house. Netting around the plants took care of that problem, but even so, my harvest was less than impressive compared to years past. The tomato harvest sauce below was made with ingredients from this year's container garden. I grow many different types of vegetables on the upper deck of my home, even throughout the cold and snowy mid-Atlantic winter. I've had luck growing broccoli, cauliflower, carrots, and some hardy greens in a hot box. This spring, summer, and now fall I have used the hot box to plant Swiss chard, kale, and green onions in successive planting and harvesting cycles. 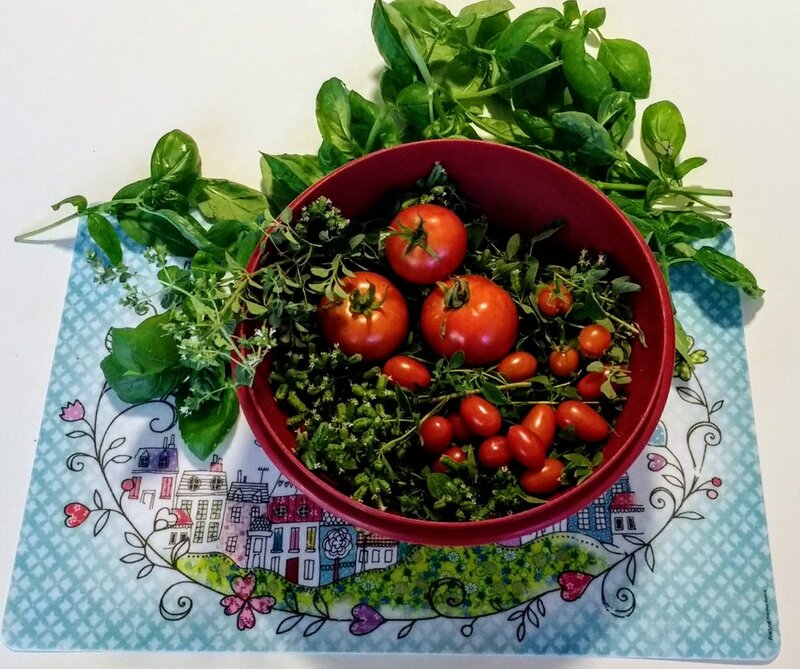 What better way to use 2017's final yummilicious tomato, basil, and oregano harvests than in a homemade tomato sauce? The recipe below was my first attempt at making homemade tomato sauce and it turned out pretty fabulous! There's an unexpected smokiness that comes from adding in a bit (ok a lot!) of Hungarian paprika and ground cumin, two of my go-to spices. blend everything in a food processor for 1 minute and it's ready to go! It will keep in the fridge for a week, or you can make larger batches and freeze.